Delaware, one of the first three United States to have already officially authorized online poker, is eyeing a September 30, 2013 launch date for the beginning of its online operations, which will all be run under the auspices of the Delaware Lottery. The launch date info comes from a piece published last week at Gambling Compliance, which contacted Delaware Lottery assistant director Rebecca Goldsmith following the closing of the application process on March 15th. According to GC, Goldsmith also released the info that 14 firms had answered the state’s request for proposals (RFPs) issued late last year. GC highlighted PokerStars and Scientific Games, which purchased WMS Gaming last year, and also mentioned six of the other twelve applicants: 888 Holdings PLC, Amaya Gaming, SHFL Entertainment, IGT, Stan James PLC, and Continent 8 Technologies. We’re hoping to obtain the names of the other six shortly, though there shouldn’t be any surprises on the list. While there may be some surprise that there are only 14 applicants for the initial rollout, there really shouldn’t be that much. The nature of the way the Delaware Lottery is structuring its introduction of iGaming seems as though it would limit many would-be suitors, and the state’s search for a “primary vendor”, responsible in turn for coordinating operations with other vendors, is another new-for-Delaware wrinkle. The gaming stuff is broken down into six separate categories as well: Casino Table Games, Video Lottery Games (x2), Poker, Keno and Bingo. Multiple vendors are allowed here, and that’s where a company such as PokerStars would fit, as a vendor in the “Poker” category. The support services also allow for multiple vendors. It’s interesting to note how Delaware’s approach contrasts with the Nevada model, where vendors and service providers themselves were allowed to combine into alliances themselves as they saw fit, with Nevada in an oversight role. In Delaware, the inclusion of internet poker into a much larger scope of iGaming and that field’s internalization by the state demanded a different approach. 1. Backend Technology Platform provider (or “Platform Provider”): The backend technology is the underlying software that provides an integrated suite of modules including but not limited to account management, network management, single wallet solution/cashier, player registration, multi-level tracking and reporting, sophisticated promotional and bonusing tools, customer service tools as well as integration with multiple Game Content Vendors. 2. Operations Management provider: The Operations Management provider is an experienced online gaming operator or a company that has demonstrated operating expertise in managing an online gaming business. 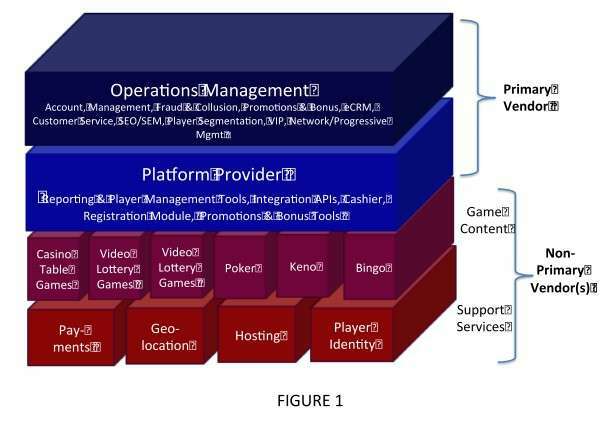 The Operations Management provider offers expertise in managing the various components of an Internet gaming operation including payments, customer service, responsible gaming policies, fraud and collusion, game play limits, network management, chat management, tournament and progressive management, general support services as well as ability to manage an online gaming business for multiple partners or brands. The Operation Management expert also is a leader in bonusing and promotions, marketing, VIP Management, player segmentation and communication (which may or may not be part of the required services). 3. Game Content Vendor(s): Game Content Vendors develop and offer games that are found in a typical casino environment, and whose games are based on a predominance of chance including but not limited to casino table games, Video Lottery Games, poker, keno or bingo. 4. Support Services Vendor(s): Support Service Vendors provide third party expertise required for a robust and secure Internet gaming operation. Such services include but are not limited to payments, hosting, player authentication and identification, geo-location, IP blocking, etc. You know what’s interesting about that? Look closely at #2 and #3. The operations management provider (#2) will be tasked with “bonusing and promotions, marketing, VIP Management, player segmentation”, etc. It doesn’t look like it’s hard and fast yet, but it would be interesting if a potential vendor such as PokerStars, if approved as a #3, would then be severely restricted as to type and nature of promotions and marketing it could offer.